It’s that time of year. That time when your kids will start bringing home their Science Fair flyers and parents start to sweat about suggesting ideas. Our job here is to help make that time a little easier by suggesting a few projects guaranteed to peak your kids interest in light and optics. We have tried to include a project for any grade level. What you need: A clear class of water, a firm piece of paper, a marker. 1. Draw horizontal arrows on the paper. 2. Put the paper with arrows directly behind the glass of water. 3. While viewing the arrows through the glass, slowly pull paper away from glass until one arrow reverses direction. Discussion: What caused the arrow to suddenly reverse direction? 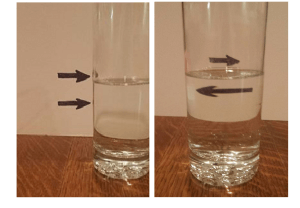 What happens if you use different size water glasses… Does the position of the reversal change? This science fair project demonstrates the concept of refraction. Refraction is the process of an image changing direction as it passes from one media (such as air) into another (such as water). The amount of refraction depends upon the difference in the index of each material. Air is assigned an index value of 1. Materials such as glass or water are optically denser than air, and therefore have an index value higher than 1. For example, water has an index of 1.3 and a diamond has an index of 2.4. This higher index causes light waves to travel more slowly while in the new media and therefore bend. The direction of the bend depends upon the angle the light makes with the new media. A convex surface, such as our glass of water, will cause the image to converge, whereas a convex surface will cause an image to diverge. So how does this explain the arrow changing direction? It will help to draw a picture of what the image of the arrow is doing as it moves further away from the glass. This is an example of a ray tracing, showing where each part of the image is located for a given distance away from the media, in our case the glass of water. Concepts: Neutralizing the refraction of an object by using similar refractive indexes. 1. Fill large glass measuring cup with Wesson vegetable oil. 2. One at a time, put the various glass objects into the large oil filled cup. 3. Are you able to see the object in the large cup? Discussion: Why do the glass objects placed in the oil disappear from view? Do they all disappear equally or do some disappear from view more than others? If they do not disappear equally, why? As we learned from our previous experiment, images are formed by a process called refraction. Refraction occurs when the light of an image passes from a material of one index into a material of a different index, such as from air into glass. This changes the direction of light rays by changing the speed of the light waves, and therefore allows us to see the object. However, in this experiment, Wesson oil has approximately the same index as glass. 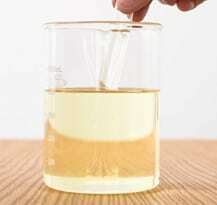 So no light is refracted as is passes from the oil, through the small glass object, and back into the oil. No refraction means no image! Not all glass objects have the exact same index. The closer the index of the glass object is to the Wesson oil index the less visible the object in the oil will be. The index of Pyrex cooking glass is nearly identical to Wesson oil (both have an index of about 1.47) so Pyrex objects will disappear more completely than non-Pyrex glass materials. So why are we able to see images of objects sharing the same air we are in? Because although our bodies may share the same air, our eyes are a confined optical system. The lens within our eye has a different index than air. An image passes through the eye’s lens, being refracted, before reaching our retina (the image-sensing tissue in the back of our eye). This is why the retina is located in the back of the eye. If the retina was on the front of our eye, collecting light rays before those images were refracted no image would be formed and we would be unable to see objects in air. 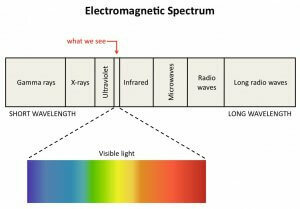 Concepts: Understanding the electromagnetic spectrum and where our vision fits within it. 2. Point the remote control towards the smartphone video camera. Discussion: What did you see coming from the remote control? Play back the video you recorded from your phone’s camera and what do you see? How do you explain this? There are far more colors out there than what the eye can see. Infrared from your remote controls is one. Our eye’s receptors are only tuned to see what we call the “visible light” spectrum of colors, basically the colors of the rainbow. The colors we see are dependent upon their wavelength (blues have shorter wavelengths and red longer). But as this science fair experiment shows, we have methods to find wavelengths outside of what our eyes are designed to see. While our eyes can not see infrared light, the sensors in your phones camera can, making the invisible visible. The spectrum seen by humans is unique only to humans, as is the spectrum seen by each living thing. It is possible for other animals to see wavelengths outside of the human vision spectrum. Bees for example can see ultraviolet light (to the left past violet light on the spectrum.) And snakes can see infrared light as we saw in this experiment (to the right past red light on the spectrum).